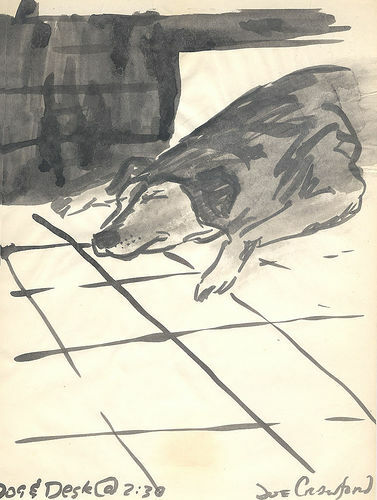 Omega the Dog, ink on paper, 1987. This was from the summer after high school and before moving to Virginia. Omega was a good dog, loving, goofy, and she made a great pillow. I have another drawing of Omega that’s pretty good, when I post that I’ll talk about all my memories of Omega. Today: tired from driving 320 miles yesterday. But I’m taking care of business, baby. Joe Crawford blogged this at 11:34am in 2005 in August. The 11th was a Thursday. You are reading this 14 years later. Comment. There is one comment Tweet. Send email. It has hashtags→ drawings memories .